News and Commentary from the Cannes Lions 2008 Advertising Festival. The Financial Times blogs from Cannes on the impact which agencies from China and India are having at the festival, from winning big to packing the Palais with their presentation. Daniela Riccardi, Procter & Gamble’s Greater China president is quoted by the FT as saying, “This is the first year that China comes across in a significant way in Cannes.” Read more over on FT.com. HBO has won the Grand Prix in the Outdoor category at Cannes. View the video by clicking here (free on AdForum.com). BBDO New York used the trifecta of an outdoor event, web film, and interactive website to reinvent the art of storytelling. Last summer in Manhattan a giant life-size movie was projected onto the side of an apartment building. It appeared to show what was happening inside the individual apartments, with individual inhabitants going on with their domestic activities. Passersby could seemingly peek into the lives of the city dwellers. Blogging over on LeFreaque.com(Adweek's Cannes blog), Susan Credle, exec CD at BBDO New York, sheds some light on the raw quantity of work the jurors must review in a day, and advises on what type of beverage would make the process easier ("non-non-alcoholic"). You can check it out by Clicking here. There's a really nifty interactive map and commentary on the upcoming parties and events on Portfolio.com. Tony Bennett headlines Thursday's Corbis/Sony BMG/ Yahoo party. See the map by clicking here. That's right, we're doing it again. Last year we sent our CEO all over Manhattan looking for a new iPhone as punishment for having a good time in Cannes and leaving us behind to work. This year, we want him scurrying around to find you the newest MacBook Air. You can enter the contest by following this link. 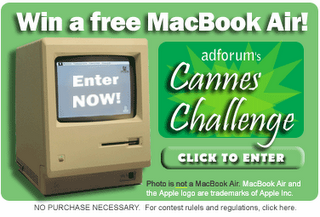 Apple has nothing to do with the contest, but we're sure they wouldn't mind you having a peek of the MacBook Air over on the Apple site. The organizers of the Cannes Lions 55th International Advertising Festival today announced that over 28,000 entries from 85 countries will be competing for the coveted Lions at this year’s event, an increase of 10.2% versus last year. Without taking into account the new Design Lions category, the increase is 5.8% . "We are seeing strong growth right across the categories and right across the world," said Philip Thomas, Festival CEO. "This is the fifth year in a row that we have seen record entries into Cannes, another indication that agencies and clients across the world are embracing creativity and wishing to showcase their work at a global level at the Festival." Our team will be on the ground during the entire Cannes festival. We'll be blogging what we see and hear -- come back often and join in the discussion. Posting is easy (no registration required). IN CANNES: Herve de Clerck, Chris Wynne, Isa Kurata and Philippe Paget. IN PARIS: Maud Largeaud.